Jess Jones Vineyard is an off-shoot of Jess Jones Farms, a two-generation farming operation that was started by Jess’s dad, Jesse W. Jones, back in the 1920s. After Jess finished college and a tour of duty with the U.S. Army, he and his father formed a partnership and then a corporation, farming over 3,000 acres of row crops until their retirement. Jess planted his wine grapes in 1997 as a test plot to find out which varieties grew best in the rich soil and delta climate on their farm just south of Dixon. Their first wine was bottled from the 2000 crush, and it was surprisingly delicious and well-received. While Jess was attending many classes at U.C. Davis on grapes and wine production, wife Mary Ellen (Mel) was teaching school in Dixon. 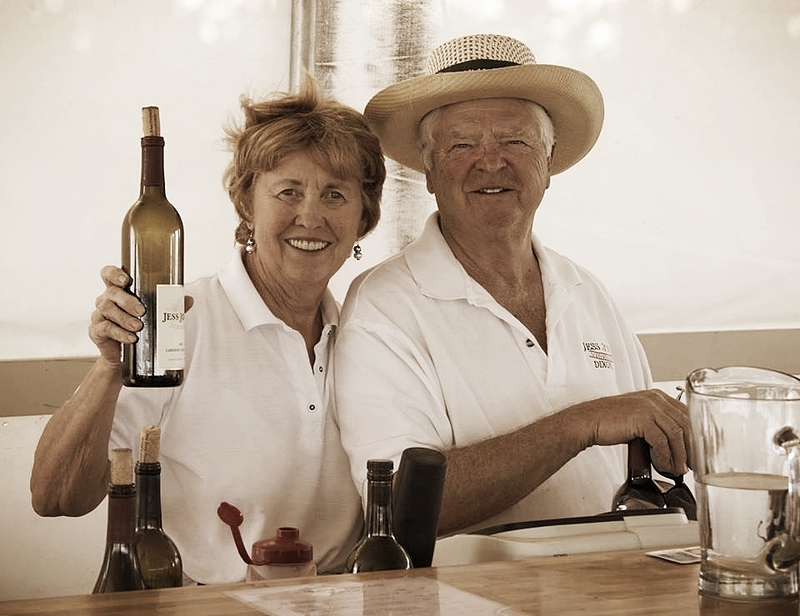 She retired from teaching in 2008 and joined in on the fun at the winery. Jess and Mel added the Tasting Room in 2008 and the Event Center in 2009, with events held at the vineyard nearly every week during the spring, summer, and fall months.